The bible says the bible is wrong. And since the bible is the word of god, the bible must be right about the bible being wrong. Because the bible says so. 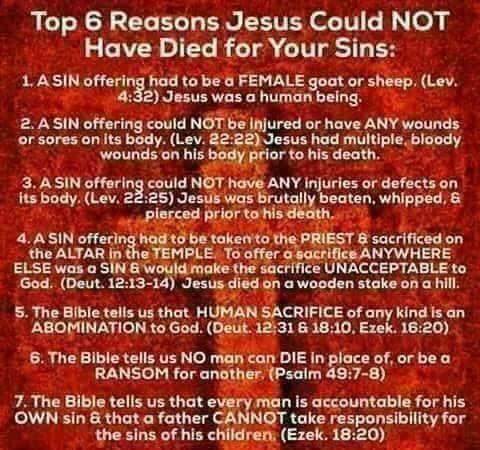 Too bad this can’t be sent to every preacher of the “gospel.” Of course, as with all things that contradict their beliefs, they would find a way around it. He’d probably do his usual thing and talk about how “God” made everything and can’t be wrong about anything. He’s a superb example of total indoctrination. Actually, I don’t think of CS in those terms. Yes, he’s pretty convinced his perspective is the correct one, but I don’t consider him “fanatical” — mainly because I don’t think he would do anything to harm another person. He’s just very stuck in his beliefs (typical of most believers) and isn’t open (at all!) to any proof/evidence that contradict them. Whoops! Hit something that caused my comment to “post” before I was ready. To finish my thought … even when the evidence is indisputable. Scottie, I can’t speak for CS, but I do think those who strictly follow the bible will act according to what they believe it says. We can’t wave away 2500 years of indoctrination no matter how hard we try. What we can do is present the more “modern” way of seeing things and hope it gets through. But when push comes to shove, trying to convince the hard-cores is pretty much an impossible task.